Welcome to the Hive – the home of the Killer Bees! What a great season with FIRST Power Up! The team debuted our first ever FRC “double reverse four bar” lift AND we competed with a swerve drive. As a result of these innovative designs and hard work by the students and mentors, we won the Southfield and Windsor-Essex District event and were finalists at the Milford District event. In addition to the on-field robot performance, the team earned a District Chairman’s Award, a Team Spirit Award, and a Quality Award at district competitions. During the highly competitive Michigan State Championships we were awarded the Imagery Award. The sweet finish to the season included a Creativity Award for the Daly division at the Detroit FRC Championship. The official 2018 FIRST season is over, but the Hive is always buzzing! We will bee at offseason competitions including the Big Bang! 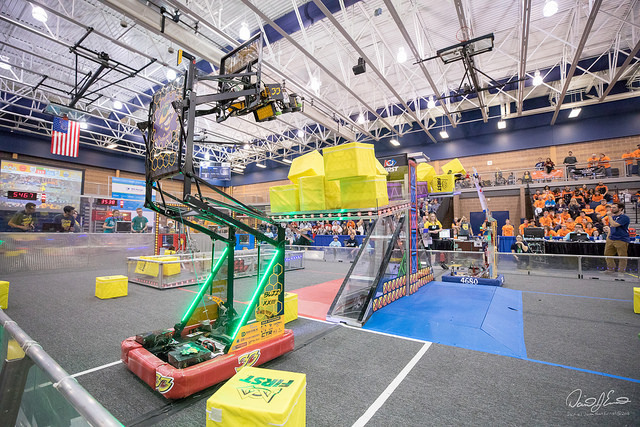 in Taylor, the Indianapolis Robotics Invitational, Kettering Kickoff and the 7th annual All Girls Tournament at Bloomfield Hills High School. Michigan High School students – You can earn a semester of elective credit for participation on a FIRST Robotics Competition Team. Click on this link for the official memorandum from the Michigan Department of Education. Print the memo and take it to your school!